Looking for a step by step local SEO guide to boost local rankings for your business? Local SEO is very important for the success of small businesses that operate under a specific location. This step by step local SEO guide will help you boost your local search rankings and grow your business. Most of the local businesses focus on immediate results such as paid advertising to get leads. However, local SEO can give you long-term leads if you manage to rank your website after doing some keyword research. 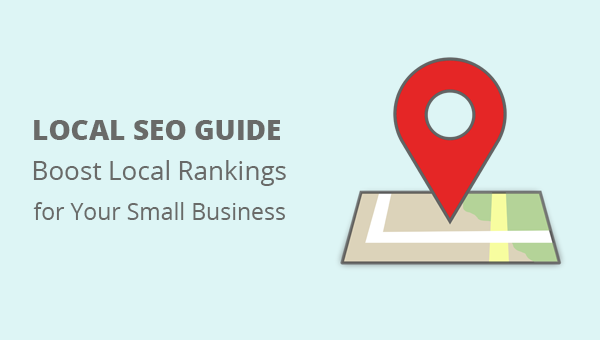 This post is about optimizing your local business website to rank in local search results. This helps you get targeted local traffic, and organic leads, brand recognition. Also, check out this local restaurants SEO guide if you have a local business which serves customers on a specific location. How Local SEO will help your small business? Local SEO will boost your website ranking in your city, state/province. If your services or retail business is limited to a local region, then you must focus on getting customers from your local area. Without proper local SEO, it would be difficult and costly to sustain your online small business. Every business that relies on getting local customers can benefit from local SEO. However, it doesn’t mean that you should not focus on other marketing methods. If you want to promote your business online, then there are countless ways you can do it. Local SEO can boost a website’s ranking in local searches. If you have a business location, then you can use it to target customers in the local area. You can also use a business location in ‘Google my business listing’. It will assist your customers to locate you and get in touch with you. Search engines like Google optimize search results based on a user’s geographic location and businesses located in proximity to their location. Local organic results mostly include websites or web pages with local relevance to the business. Directories such as Yelp, Yellow pages, and Facebook are often included in the organic search results. Also, your website lies within this area of local search. Google my business listing and the information displayed in the listing are considered local pack. The information included by a business owner, user submitted information such as reviews and uploaded photos are some of the ranking factors. These factors boost the ranking of ‘Google my Business Listing’ in Google Maps and Google search results. You can also download free stock photos and videos to include in your posts. It depends on Google to show either local pack results or organic search results when a user types the query in the search box. However, using local SEO best practices, you can improve the chances of appearing in both of these results for a given keyword. If you are tired of getting no sales on your website, then I can help you. I am a freelance SEO consultant who can boost your sales to the next level. Get in touch now! Write high-quality content, more content means more opportunities to picked up by Google. Use variety of keywords per post but make sure that all of those keywords are relevant. Reviews on Google My Business listing are one of the important factors in local pack ranking. If you want your listing to show up more often then you would need more reviews from genuine customers. Verify GMB, publish photos of your business place on the listing, and add opening hours. Use one most important keyword in your Google My Business listing. Use schema structured data to optimize for a local region. Use Schema reviews markup on your website. Add Name of your business, Complete address and Phone number. Get backlinks on your local region anchored text. If your business is targeting different locations then use different pages to target all those locations one by one. Check for consistency across all your business information whether posted on your website or off site. Optimize images for local searches, include your city, neighborhood or state in the alt tags and image names. Prominence – That shows how popular is your local business in offline world. Google uses already available information on your business and brand name. Such as how much your brand name has been used throughout the Internet, which websites are linking back to your website or local business listing and many such factors. Relevance – Google algorithm determines which local business listing to show at the 1st position in local search results and Google maps. Distance – It is one of the ranking factors especially if someone uses nearby searches in Google maps and Google search. Google algorithm find out which of the results have the best reviews and flexible timings. There are many ranking factors which are considered by Google algorithm. However, if you keep doing hard work to satisfy your customers/clients, Google will more likely show you up in searches. Because Google tracks your customer’s feedback, distance, their likes, and dislikes. If more people like your brand and start searching your business in Google, your business will boost its ranking. Let me know what do you think of these local SEO ranking factors in the comments below. If you like this article and found something useful, please don’t forget to share this article. Thanks a lot for this amazing post. This Post is the consist of New Ideas and Information. Keep It Up. Your article is extremely very enlightening and unique as well. I like the way in which you describe each and everything. Continue sharing these type of article.